Two more weeks of school before our Winter Break! It always seems to go quickly in retrospect, but while we are in the thick of it...SLOW. We decided not to travel this Christmas, our first stay-home Christmas holiday since 2013. Super-excited to just stay here and enjoy Christmas in Shanghai! I'm trying a new format for the New Release Spotlight this week. I hope it looks a bit cleaner and is even more helpful than before. I wanted to add more space and provide room to say all that I need to say for each book. I'm now including number of pages and a quote from reviewers for each book. Several titles also include readalikes. And now for some fun news! I enjoyed the blog hop from last week so much that I'm doing another giveaway this week! 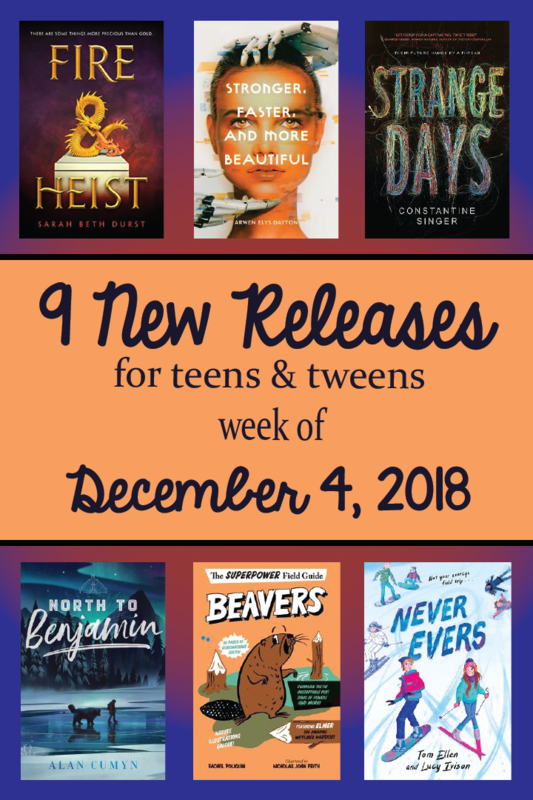 This time, it is for any book of your choice on this New Release Spotlight OR any New Release Spotlight from the month of November. That's right, you get to choose any new release you want from my past five weekly lists. This is my way of saying a huge THANK YOU for another great year of supporting my MrsReaderPants blog and TPT store! And since I am myself an expat living in a foreign land, this giveaway is open worldwide. I'll announce the winner in next week's New Release Spotlight. Good luck! In the meantime...two more weeks...we've got this, y'all! The future is curious. Today our bodies define us. We color our hair; tattoo our skin; pierce our ears, brows, noses. We lift weights, run miles, break records. We are flesh and blood and bone. But tomorrow has different rules. The future is no longer about who we are--it's about who we want to be. If you can dream it, you can be it. Science will make us smarter, healthier, flawless in every way. Our future is boundless. This is a story that begins tomorrow. It's a story about us. It's a story about who comes after us. And it's a story about perfection. Because perfection has a way of getting ugly. In Sky Hawkins's family, leading your first heist is a major milestone. It's a chance to gain power and acceptance within your family, and within society. But stealing your first treasure can be complicated, especially when you're a wyvern--a human capable of turning into a dragon. When Alex Mata comes home to find an alien has murdered his parents, he's forced to confront a new reality: aliens are real, his parents are dead, and nobody will believe him if he tells. On the run, Alex finds himself led to the compound of tech guru Jeffrey Sabazios, the only public figure who stands firm in his belief that aliens are coming. At Sabazios's invitation, Alex becomes a Witness, one of a special group of teens gifted with an ability that could save the Earth: they can glide through time and witness futures. When a Witness sees a future, that guarantees it will happen the way it's been seen, making their work humanity's best hope for stopping the alien threat. Eleven-year-old Edgar knows whenever his mother gets “the look” they won’t be staying wherever they are for much longer. Soon it will be another town, another school, and, for Mom, another man. This time they’re leaving Toronto—and Roger—behind for the wilds of northwestern Canada. For once, though, Edgar is excited. They’ll be house-sitting and caring for Benjamin, an old Newfoundland. Edgar and his mom soon meet Caroline, a girl Edgar’s age, and her dad, Ceese. The moment his mom and Ceese meet, Edgar knows She’s going to make him the next Roger; the next man his mom will leave. It doesn’t matter that Ceese has a longtime girlfriend, or that Edgar and Caroline are becoming friends—his mom always gets what she wants. Brooklyn, Earth. 1949. Lily Lupino is going to be an astronaut when she grows up. For now, she'll have to settle for listening to science fiction programs on the radio. But when certified Spacetronaut Kosmo Kidd crash lands his wind-up rocket ship in Lily's kitchen, it's a chance Lily can't pass up! Mistaking Lily for a boy, Kosmo agrees to take her back to his floating treehouse in the stars, but it doesn't take long for the other Spacetronauts to figure out that Lily is a girl. Banished to the far reaches of Outer Outer Space, Lily and Kosmo explore exotic alien worlds, meet a menagerie of colorful creatures, and tangle with the vilest villain in space, The Mean-Man of Morgo. Thirteen-year-old Mouse is pretty sure her life is totally over. Now that she's been kicked out of ballet school, she has to go on her new school's ski trip basically knowing no one. Well, except too-cool-for-school Keira and Crazy Connie-May. Meanwhile, Jack's life is just about to begin. He's on the way to the slopes with his school too, and all he can think about is how to successfully get his first kiss. But with new friends by her side, Mouse has more fun skiing and building igloos than she expected. And when Jack catches Mouse's eye in the at the ski resort, he's smitten. All's well--that is, until mega pop star Roland arrives on the scene and sets his sights on Mouse, too! A week in the snow is about to get complicated. Meet Elmer, an ordinary beaver. He may not be as mighty as a lion or as dangerous as a shark. He may be squat and brown. Butnever underestimate a beaver. I can almost hear you saying, "But aren't beavers just lumpy rodents with buck teeth and funny flat tails?" Yes, they are! And believe it or not, those buck teeth and funny flat tails are just a few of the things that make beavers extraordinary. Shahad, a refugee who has moved to a new country, has started at a new school. Shahad comes to school every day with perfectly braided hair tied in ribbons. But her hair can't hide the scars on her face and leg that are painful reminders of the country she fled, making her feel less than beautiful, and different from her peers. Generous and eccentric, Miss Pinkeltink fills her huge purse with everything from a toilet plunger to roller skates, and then gives it all away. She offers tape to fix a flat tire and a bone to a kitty: Miss Pinkeltink's gifts never quite hit the mark, / but she gave what she had, and she gave from the heart. And then, with nothing left to give or to shelter herself, she huddles on a park bench, trying to sleep in the rain. And that's where Zoey sees her from her bedroom window and knows that something must be done. JOIN THE CONVERSATION! WHICH RECENT NEW RELEASES HAVE SPARKED YOUR INTEREST? Never Evers was a fun read. I need to catch up on some of the others. I want to read Deogratias: A Tale of the Rwandan Genocide. I teach a unit on tolerance and this would be a good fit. If you teach upper-MS or HS, you could pair Deogratias with How Dare the Sun Rise by Sandra Uwiringiyimana. At age 10, the author survived the Gatumba Massacre (Burundi, 2004) and then immigrated to the US as a middle schooler. My 7th and 8th grade girls LOVE thriller mysteries! Would love to read how she died, how I lived. Oh, yes, my 7th/8th grade girls are all about April Henry right now. And interestingly...Agatha Christie has been requested a couple of times recently. Maybe one of the teachers talked about Christie's books? I loved the entire Enola Holmes series so I am looking forward to reading the graphic novel adaptation. And the Superpower Field Guide to Beavers looks awesome! LOL--when I wrote the Beavers book up, I thought beavers sounded so random. I figured the author must have written a lot of animal "field guides" or be some sort of specialist on beavers. But...the only other one she's done is Moles. Also random! I like the new format and always enjoy your posts. Thanks, Wendy! I was finding the previous format too restricting because I tried to keep the description no longer than the size of the book image. Not easy when I want to include more information! Miss Pinkeltink's Purse Looks awesome! We have so much homelessness in California and kids need more books to understand this epidemic. Yes, I've been reading about California's homeless problem. Miss Pinkeltink looks like a great way to introduce the little ones to the homeless and help them to show compassion toward the homeless. Loved the "Read Alikes" -- now I am going to have to read Strange Days if it is anything like The 5th Wave! I will definitely be getting that one! I would love to read Five Feet Apart and add it to our library collection, books that are turned into movies either big screen or streaming sites or tv shows are always flying off my shelf! Yep! I've shown the Dumplin' trailer this week in the library, and suddenly it's checked out with holds. The movie does look pretty cute, and I loved the book! I want to read Queen of Air & Darkness. Ah yes, Cassandra Clare is a popular choice in my library, too. I read books 1 and 2 of The Mortal Instruments, but I haven't read The Dark Artifices at all. I think my students would love Strange Days. Thanks for the review! Strange Days looks really cute, doesn't it? It will be an easy-sell for middle schoolers. This is my first time going through your site. I will be back often. And Thank you for providing such interesting content. I am sure my Library students will benefit from it. Glad to have you along! I post the New Release Spotlights every Tuesday morning, and I'll be doing the book giveaway throughout December. I am reading David Arnold's "Kids of Appetite". It's heartwarming, heartbreaking, and entertaining JF without dragons or post-apocalyptic utopia! Try his "Mosquitoland" too for YA. I had a student recommend Mosquitoland to me, and I never read it. I'm working on my Christmas break TBR, so I'll see if it's in. I quickly added Stronger, Faster, and More Beautiful to my next Amazon order. As always, thanks for keeping us informed on all the new titles! Love me some Mrs. Readerpants!!! Awww...Thanks, Tricia! I just ordered Stronger, Faster, and More Beautiful for my school, too. Looks interesting! I am so excited to read North to Benjamin! North to Benjamin looks like just what my library (and Me) needs! I have been a librarian for four years and am having a blast! I just genrefied my fiction chapter books and it has been an awesome process. My aide, who has been working in the library for many, many years, dug her heals in and pouted the entire time. However, I think that she is excited at how quickly she can shelve books and how easily kids can locate their favorite reads. She is slow to compliment and quick to fuss, but I think we've won her over and made her job much easier. I like how you can truly see the holes in the library and start ordering where the needs are. I changed the sublocation in my Destiny catalog and it is working beautifully. The new signage looks fabulous, too, and is drawing my readers in. Did you genrefy your Easy Read Collection? Thank you for all of your advice and encouragement. I am truly excited to update a very old library and bring it back to life.